Habitat : Western himalaya from kashmir to assam, arunachal pradesh and in northern andhra pradesh, also in maharashtra, uttar pradesh and uttaranchal. 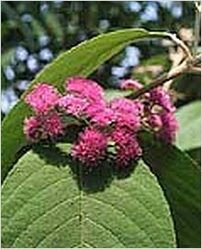 Uses : The flowers and fruits are bitter, sweet, astringent, acrid, anodyne, stomatitis, expectorant, depurative, anthelmintic, deodorant, digestive, styptic, febrifuge and good tonic. Flowers and fruits are useful in rheumatoid arthritis, asthma, catarrh, anorexia, headache, foul ulcers, flatulence, colic diarrhea, dysentery, skin diseases, burning sensation, excessive sweating, diabetes, vomiting, fever and general debility. Leaves are useful in gout and arthralgia. Root is chewed to relieve rashes on the tongue.